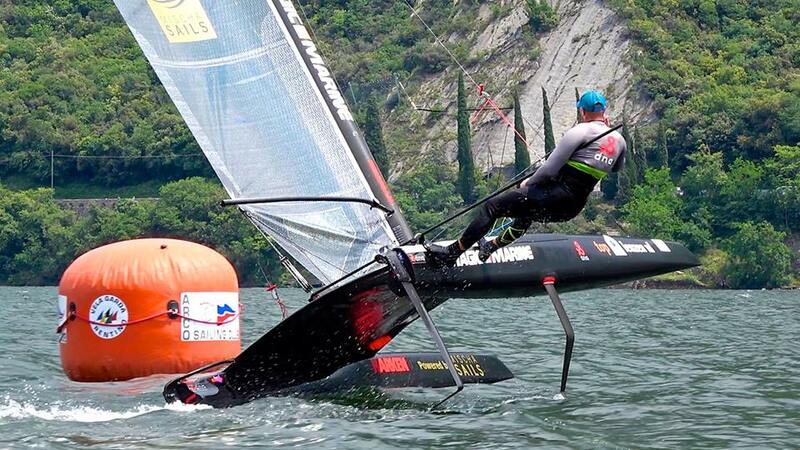 Photo: Circolo Vela Arco fb - 3 bullets for Mischa Heemskerk on the new Dna F1 / Mischa Sails to take the event at Garda. Second place for Helmut Stumhofer on a Scheurer G7 and 3rd for Jakub Surowiec. The other contender for the week, Timek Bendik , broke his mast yesterday so he missed two races. Today he scored 2,3,2. The polish young gun put pressure in the first stage of the championship with two bullets on the water (one ocs finally though) but Mischa got back in the final day to dominate the fleet and his matches against Bendyk. Excellent results for both, Mischa confirming to be the 'Scratch' and benchmark along Ashby, (if they enter a race they surely win it), just like Nole or the Brazilian Football team some long years ago... cause now they are an embarrassment... hehe. The news of the event were reported on Friday with the excellent performance of the new Exploder D3, giving Timek Bendik the tool to race 1 to 1 against Mischa in the breeze and dying winds. I don´t have feedback from today's races still. Thilo was doing good overall in floating mode but missed the rest of the races on crash to his boat. We might expect competition at Medemblik from the Exploder camp with the Polish sailors plus Brewin , Bundock and others. Last year Punta Ala was a great 160 boats Worlds, excellent venue and else but the fight for the title was literally a two man show depite any beachpark complains on the matter.